Special rooms of the CHOC Children’s Neonatal Intensive Care Unit are designated for the Neurocritical NICU, where we have the expertise and equipment to carefully treat and prevent neurological issues such as seizures, asphyxiation and brain damage. Our pediatric board-certified neurologists are available 24/7 to partner with our neonatologists to make a specialized treatment plan together for our patients. In the NICU, 12 beds are equipped for long-term video EEG monitoring, which is used to evaluate a baby’s brain activity and behavioral activity for an extended period of time. This long-term monitoring is crucial for detecting newborn seizures that are not always physically apparent. Patients are monitored around the clock by registered EEG technologists, and neurologists are always available for consultation when questions arise about an infant’s behavior and physical signs. Our neurologists can also remotely access the video and EEG monitoring equipment to assist in treatment planning. Based on the results of the studies and work-ups, our pediatric epileptologists can detect seizures in an asymptomatic infant and work with the neonatal team to develop individualized treatment recommendations. Learn more about our Comprehensive Epilepsy Program. 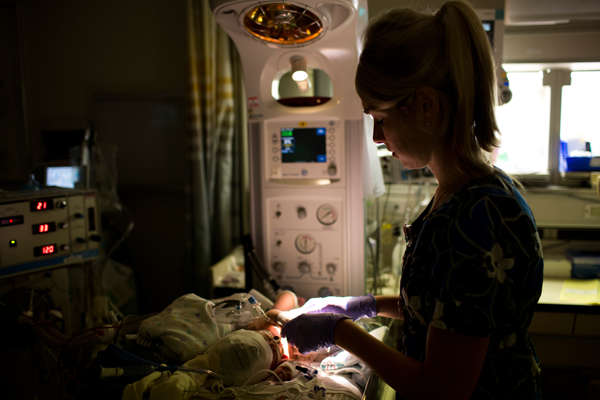 The Neurocritical NICU uses advanced hypothermia treatment, a proven technique for minimizing the effects of hypoxic-ischemic encephalopathy in newborns. Treatment must begin within six hours of birth. We offer the Blanketrol® III Whole Body Cooling System. The NICU also offers a CritiCool transport body cooling device that allows our Transport Team to begin hypothermic therapy at the moment we accept an infant from an outlying facility. That means we can quickly reach more newborns in a wider geographic area with this specialized treatment. What is hypoxic-ischemic encephalopathy (HIE)? If your baby has a condition called hypoxic-ischemic encephalopathy (HIE), this means that your baby’s brain has been deprived of oxygen before, during and/or after delivery. The seriousness of HIE depends on how long your baby was without oxygen, the affected area of your baby’s brain and how developed your baby’s brain cells are. HIE is an injury that can develop over the next few hours to days. There are three categories of HIE: mild, moderate and severe. Most babies that have mild HIE recover with no disability. About 40-70 percent of babies with moderate HIE have some form of lifelong disability like cerebral palsy, impaired brain function and seizures. The most severe cases almost always result in severe disabilities that may include mental retardation, severe motor dysfunction and seizures. Severe HIE can also cause death. Your baby’s doctor will talk with you about how severe your baby’s HIE is, and what to expect in the days and weeks ahead. Most of the time, the cause of HIE is unknown. Bleeding or problems with the mother’s uterus, the placenta or umbilical cord could cause HIE. Why is it important to treat my baby for HIE? Babies who have HIE may develop problems with breathing, bleeding and with their heart, liver and kidneys because of the lack of oxygen and blood to these organs. Some of these problems may need treatment right away. When the brain injury is moderate or severe, your baby can have seizures, and later in childhood can have problems learning, thinking and speaking (called cognitive problems). They can also have problems with walking or coordination, sometimes seen as cerebral palsy (called motor problems). What is the treatment for HIE? • Blanketrol® III Whole Body Cooling System: Your baby will lie on a special cooling blanket that has water running through it. The water temperature can be adjusted to warm or cool the body. Normal body temperature is 98.6°F (37°C). Your baby will be maintained in a range between 91°F -95°F (32.5°C-35°C) during the cooling process. • Olympic Cool-Cap System: Your baby will wear a special hat (like a swimming cap) that has water running through it. The water temperature can be adjusted to warm or cool the body. Your baby will be maintained in a range between 92°F -95°F (33.5°C-35°C) during the cooling process. How is hypothermia treatment provided and monitored? A thermometer will be put into your baby’s throat or bottom to continuously monitor his/her body temperature. The cooling treatment will last for 72 hours, or three days. We will then rewarm your baby over the next four to 12 hours, depending on which treatment is used. Your baby may need medicine and blood products to treat seizures, potential infection, blood pressure and to keep your baby calm. He or she may need the help of a breathing machine, and special IV access for monitoring, treatment and nutrition. There will be no milk feeding during treatment. Your baby’s skin may be pale or blotchy and may feel cool to the touch. You may not be able to hold your baby in your arms because it may increase the baby’s temperature. The treatment is noninvasive and is monitored closely to be sure that the baby is comfortable. What are the side-effects of brain and whole body cooling? Not all babies experience side effects from the treatment, although there are two temporary side effects that can be expected. The first is a minor cardiac arrhythmia, called a sinus brachycardia—which means the baby has a slow heartbeat. It is a very common when anyone, not just a newborn baby, has hypothermia. The second common side effect is edema (or swelling) of the head and scalp. This kind of swelling normally goes away by itself, or with scalp massage and repositioning. What other tests may be performed on my baby? Your baby will have testing done to assess brain function. • An electroencephalogram (EEG) after treatment will look at the brain’s electrical activity and possible signs of seizures that are common in babies with HIE. • Brain imaging (MRI) will evaluate the brain’s structure and extent of brain injury. Your baby will stay in the NICU until ready to go home. Your baby will need close developmental follow-up care after discharge—which will also help us collect information about development of babies with HIE.